Having a strong Instagram presence is a powerful advantage. And one way to get that advantage is by growing your Instagram following. There are currently over 8 million Instagram Business profiles and over a hundred million active Instagram users posting every day. Without the right strategy, it can almost feel like your Instagram post is just another needle in the haystack. In this article, I’ll be showing you 21 effortless ways to get more Instagram followers. Hosting a Giveaway is one of the best ways to get more Instagram followers fast. It doesn't matter if you have 1, 100, or 1000 followers on your account, anyone can host an Instagram giveaway. It’s simple to start and can drive a ton of Instagram engagement. 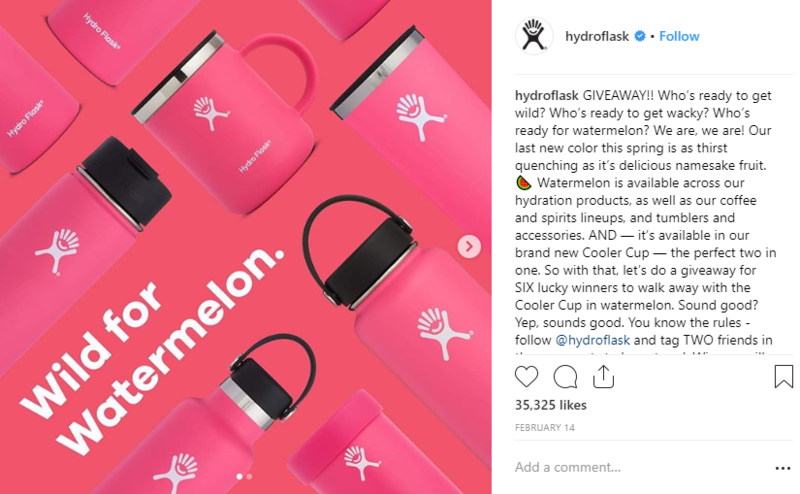 Hydroflask is well known for its seasonal giveaways and prizes. In fact, contests and promotions were one of the main ways they were able to get such an engaged audience of Instagram followers. Use an Instagram photo that will drive engagement to the giveaways. Boring photos are always avoided. Give your followers clear and precise instructions. Giving followers clear instructions on which Instagram post to like, how many friends to tag and what to comment, #giveaway, and lastly where to place the comment. Include the start and end date of the giveaway. This prevents late entries from people who are seeing your post for the first time. Place an age or location restrictions on your giveaways so your followers to know who's eligible to enter. On Instagram, you can use influencers in a wide variety of ways. One way is to partner with them to do co-promotions. Influencers are powerful when it comes to spreading awareness about new products and services. When you create a co-promotion with an influencer, you not only tap into their follower count, you tap into their credibility with that audience. One way run a co-promotion can be to give away a special discount or prize package. It’s always best to partner with influencers that share the same audience as your brand. 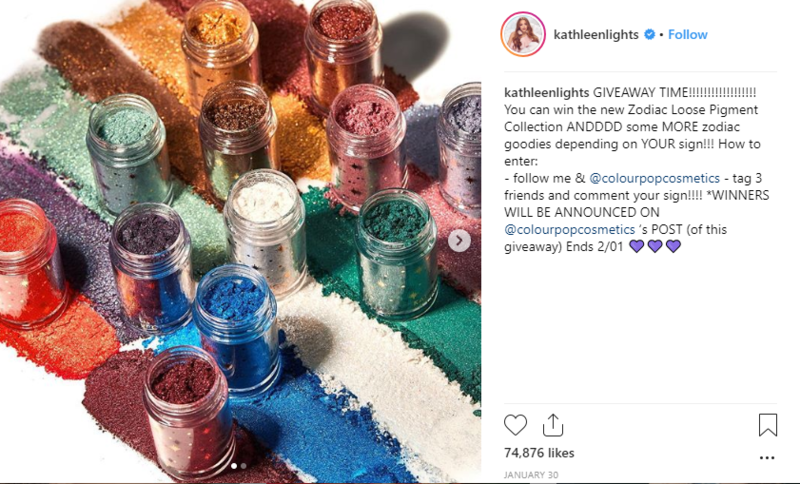 That’s exactly what ColorPop Cosmetic did when they partnered with Kathleen Lights, a MakeUp Youtuber to promote their Zodiac Pigment Collection Giveaway. Feel free to team up with another brand to host your contest for a co-promotion. It actually help you to access a wider audience which increases the chance of getting more followers for each other. 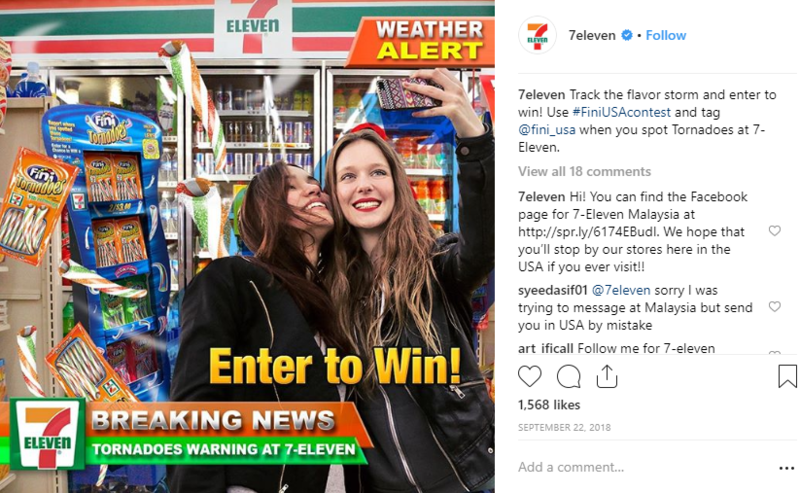 You can look at this co-promotion between 7Eleven and Fini. Using the right hashtags on Instagram is key to getting your content seen. There is a heated debate about how many hashtags you should use, it can either be too little to make an impact or too much and feel like an #overkill. I’ve found that between 10-30 Hashtags along with your own personal branded hashtag seems to do the trick. Think you're ready to master hashtags? Check out this guide on How to Use Instagram Geotags & Hashtags to Grow your Following. You can also consider tagging photos with branded hashtags. For example, BarkBox created their #BarkBoxDay branded hashtag, driving awareness for their products. There are over 177,268 Instagram posts using this hashtag that number continues to grow everyday. It’s not enough to create great content, you need to be consistent with your Instagram posting. But what if you’re too busy to be post content everyday? Social media can be extremely time consuming, but it doesn’t have to be. Managing your Instagram account isn’t as painful as you think. 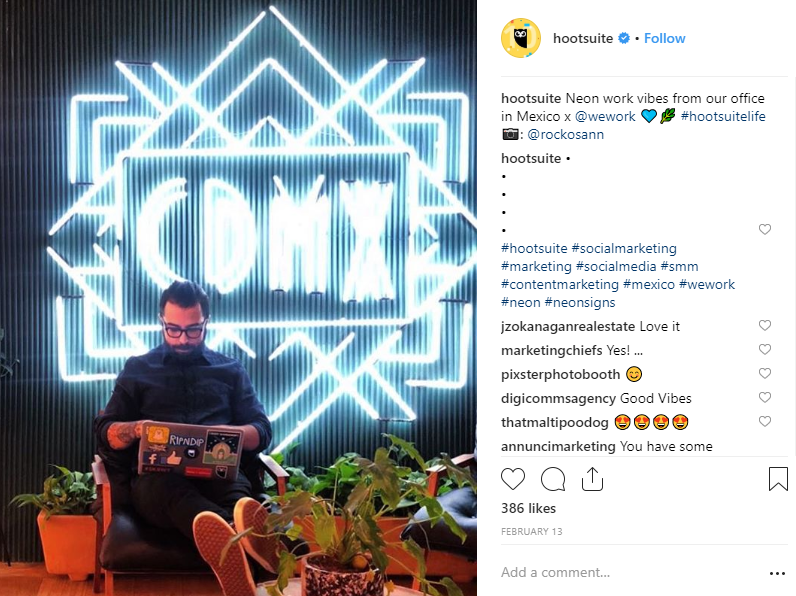 You can simply schedule your content ahead of time with social media management tools like Buffer, Later and Hootsuite. This allows you to plan out your content days or even weeks ahead of time so you can focus on other things piling up on your plate. Call-to-actions (CTA's) are a great way to engage people with your content and grow your following. A CTA can be as simple as asking your followers to share their thoughts in the comments or to share your post, as long a it encourages an action for them to take. The more engagement a post has, the more often it’ll be seen based on Instagram's algorithm. The more comments and engagement a post has means Instagram will highlight that content to your network. You can try these 25 proven call-to-action Words to add to your Instagram captions. 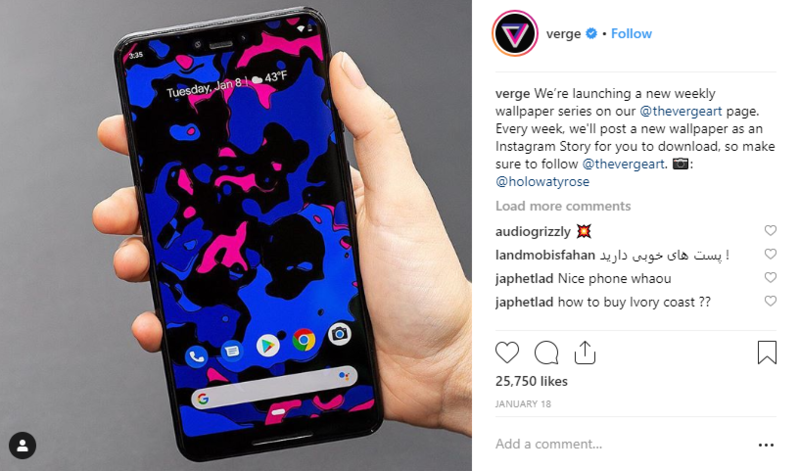 One way of adding CTA’s to your captions would be like this Instagram post from The Verge. They created an Instagram page just for phone wallpapers and asked their followers to check back and follow the page. Ask followers to share your post with others. Social media was originally created for us to be well... social. When you use your social media to do more than just sell, you can create a community or a brand personality that people will want to follow. Commenting and engaging with followers on your page is one way to do it. It also looks like there’s a living, breathing person behind your account rather than someone just sprouting out content. Sprout Social found that 29% of customers are more likely to go to a competitor if they’re ignored on social media. So every comment is a potential follower and revenue for your brand. 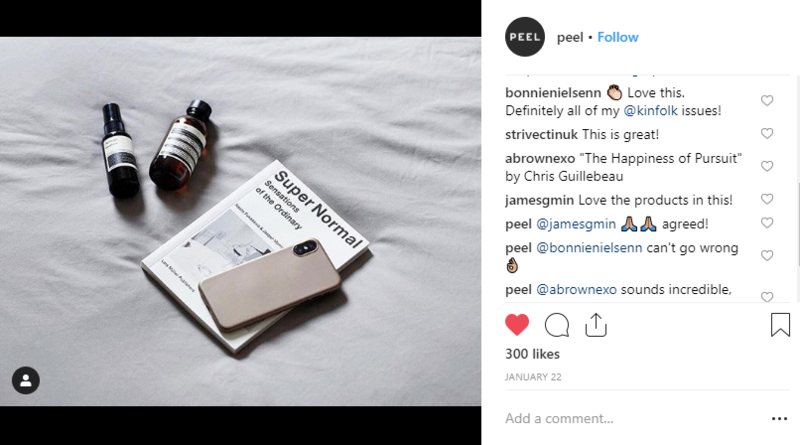 Take a look at how Peel Instagram Account uses their comment section to engage with their followers. Provide genuine replies to comments about feedback on your content. Promote on sales or products follower might be interested in. Answer questions and concerns in the comment sections. Use it to promote your brand personality (i.e the way you reply to comments). User Generated Content (UGC) is content created by individuals outside of the organization or business. It’s authentic and created by your fans. A lot of have gained followers by leveraging the power of user-generated content. And the best thing is that UGC can be from anyone, not just popular influencers. Sharing UGC is a great way to reinforce the community around your brand. Plus when you share content from real customer enjoying and using your products it makes it easier for potential followers or customers to see themselves doing the same. That’s a win-win. 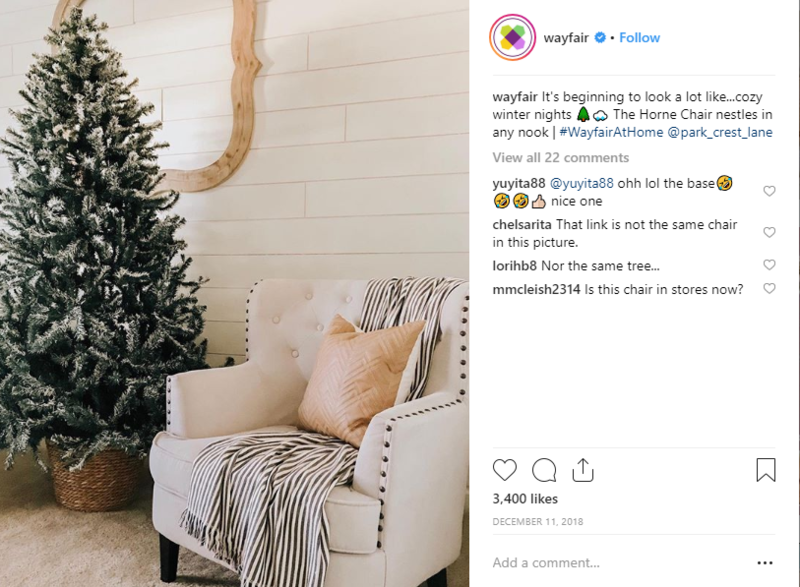 One brand known for consistently sharing UGC is Wayfair. They’re always happy to repost content from their tribe of home decor lovers. Pro Tip: Notice how Wayfair always tags the person in their own photo and comments so they know that Wayfair is using their content. Tagging is a great way to increase the visibility of your posts online. If you plan on posting user-generated content or images including other people, it’s always a good idea to tag them. This could be an Instagram Story, post, or even a video. The same can be said if someone’s posting content about you or your product. It allows viewers to find and follow your account easily without having to go through all the trouble of searching on their own. Whole Foods ensures to mention brands that are featured in their retail stores so customers can find the brand easily. Live video has already been listed as a top Marketing trend for 2019 and doesn’t seem to be leaving that list any time soon. When you go live on Instagram, your story will appear right at the front of your followers Instagram stories feed. When you go live anyone can join in and comment or live your live video. Take a look at The Business of Fashion Instagram Live covering Tommy Hilfiger Fashion Show to share the experience with their audience. For more tips on how to get started with Instagram live, check out How to Run an Instagram Live Campaign. 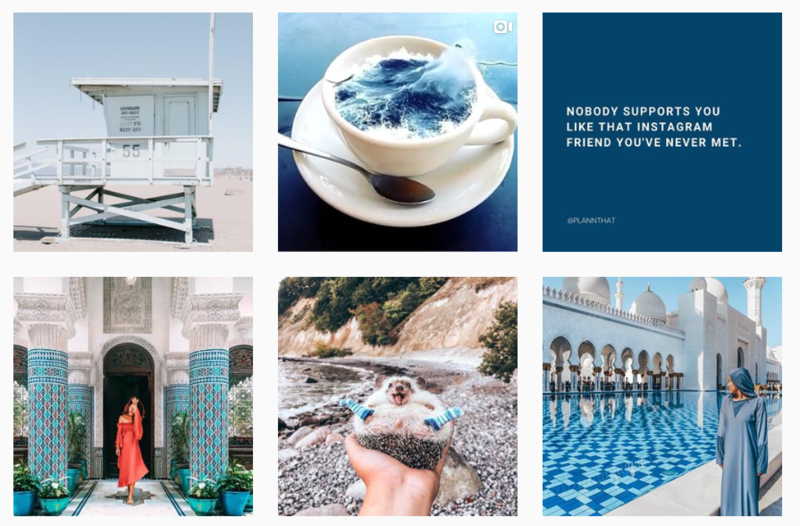 Hosting an Instagram takeover is a great way to produce exciting content and get new followers from the brand or influencer you’re partnering with. An Instagram takeover is pretty straight forward, a person takes over your Instagram account for a short period of time. It’s a cross-promotion that benefits everyone. An Instagram takeover is usually done by one host, (the person with the account) allows the guest (the person doing the takeover) to reach a new audience with their content. Guests for takeovers can be Influencers, employees, a complimentary brand, community members, or even customers. It’s usually good practice to announce and promote your Instagram takeover in advance so your followers will know what to expect ahead of time. Check out some other Instagram takeover ideas that can help guide you when you’re ready to start your own. Having a theme or aesthetic is important because it’s been proven that with the right theme or brand aesthetic on your account companies can attract more attention and gain more followers. Take a look at Plann’s Instagram account. They use various blues for their color scheme. Images, quotes and even videos to make the content interesting as they stay true to their Instagram theme. You’re probably familiar with the hashtags like #MondayMotivation then you’ve seen a few quotes being shared around on social media. 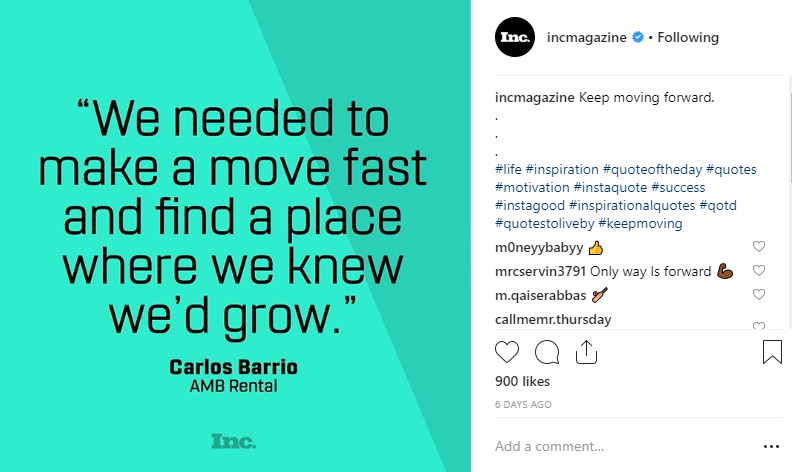 Quotes can increase your Instagram engagement rate by 30% or more. Even big brands have jumped on the quote train. Inc Magazine is popular for its quotes from entrepreneurs and founders alike to inspire their audience. You can either create your own quotes or repost quotes from others. I find that Pinterest is a great place to find quotes. If you’d like to create your own post you can use an app like Canva to quickly spruce it up. Quotes are a great way to show off your brand's personality and core beliefs. Just make sure whatever quotes you decide to post on Instagram are relevant to your target audience and followers. Wait… how exactly do Instagram analytics help you gain followers? When you use analytics tools it helps you to monitor your success and see the results of your efforts on Instagram. You can use that insight to make decisions about what content to post, who your most engaged audience is, and what time of day you should be publishing. Most social media management tools now offer some form of analytics built in, but I find that these accounts have the best tools. Influencers are a brand's best friend. Influencers help brands to build credibility, increase sales, and access thousands or millions of followers. Now more than ever influencer marketing is possible for any and every brand on Instagram. You can ask an influencer to promote a product or sale OR giveaways and contests on your behalf. Earlier we spoke about how giveaways and contests are a great way to get more followers when you can incorporate an influencer you can get even better results. 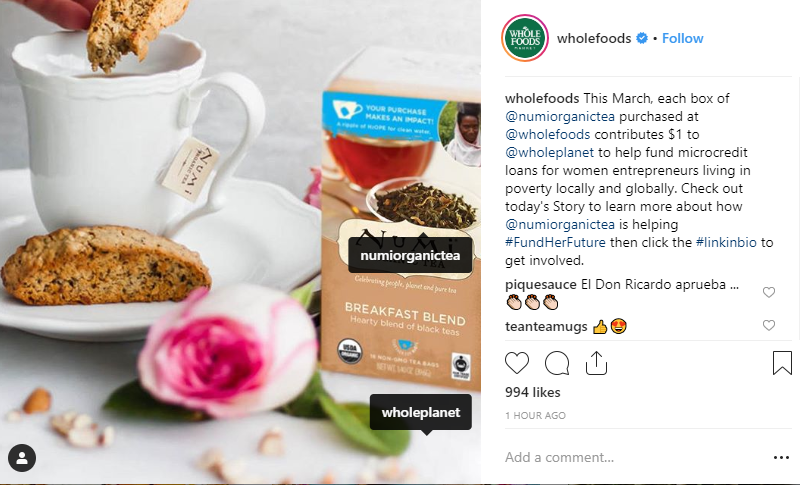 If you’re ready to add Influencers to your Instagram strategy you can use this guide to influencer marketing to get you off on the right foot. 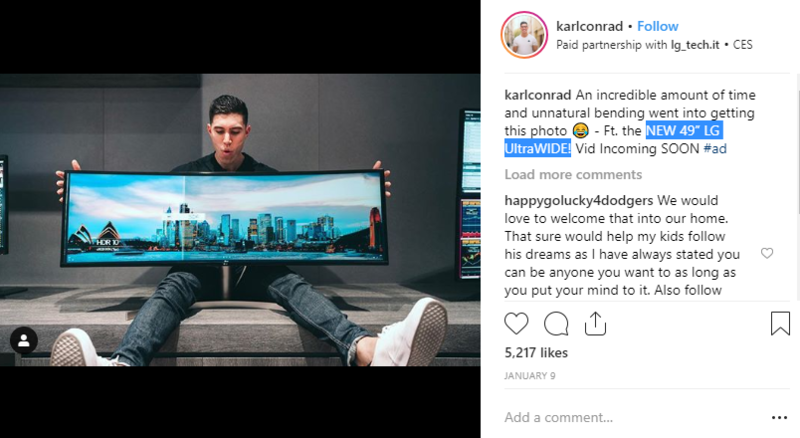 Take a look at how Karl Conard promoted the new product for LG Tech. This helped to create buzz around their new product before it even launched in stores. There’s a popular misconception that most people seem to have when it comes to following others. Some people think that you should always follow anyone who followers you, while others believe you should be very selective about who you follow to maintain a good follower ratio. The truth is you just need to find the balance in-between. You don’t need to follow every account that follows you, but don’t be afraid to follow fans, influencers, and friends. It’s just important that you don’t rely solely on following people to get more followers for your Instagram account, you can come off as you being desperate for followers and attract the wrong type of followers. You can start with following friends on Instagram, most will follow you back. Instagram now allows you to follow your Facebook friends right from your Instagram account. Just go to your Instagram profile and click on the 3 stripe icon on the top right of your screen. Select ‘Find People. You can also try following influencers or fans with large followings that are in your niche. This can be a great way to attract like-minded followers to your account. Instagram Stories now have up to 400 million daily users and growing. Stories are so popular that marketers are adding them to their Instagram marketing strategies and budgets. Updating your Instagram Stories helps to update your followers on new products or services and helps new followers to see that your Instagram account is alive and active. You can also add hashtags and geotags to your stories so anyone can discover your story and view them. You can also add links to your stories to bring people to your website. HBX uses their story to update customers on new collections. Stories are also a great way to engage with your customers with added stickers like questions, emoji bars, and a countdown to build anticipation for anything about to launch. Don’t be afraid to add Instagram Story highlights on your account, it helps followers to look back or see anything they might have missed and want to know about. Buzzfeed’s Tasty Instagram story does this perfectly with a range of highlights for customers to choose from. Video posts have 38% higher engagement on Instagram than image posts and are 35% more likely to help Instagram accounts gain more followers. Creating video content that’s exciting and engaging is a great way to grow your Instagram followers. Instagram now offers IGTV where you can create videos longer than a minute on Instagram and share them as a one minute preview in your feed. Instagram ads are a proven way to reach your target audience and get you more Instagram followers. 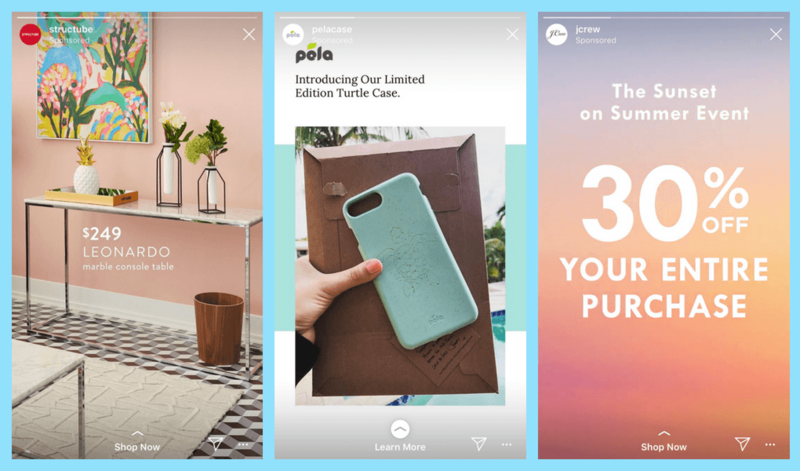 You can now create ads with Instagram Stories and Feed so you can reach a wider audience with your content. Have a goal or objective. Use a captivating image or video that will grab any viewers attention. Use targeted ads for Instagram. For more help with getting started with Instagram ads, take a quick peek at The Anatomy of a Perfect Instagram Ad. Sharing your Instagram feed on your website or blog can help to convert website visitors into Instagram followers. Let your visitors know you have an Instagram account that’s waiting for them to scroll through. Now that Instagram is more popular than ever it’s easy to find Instagram plugIn to add to your website. 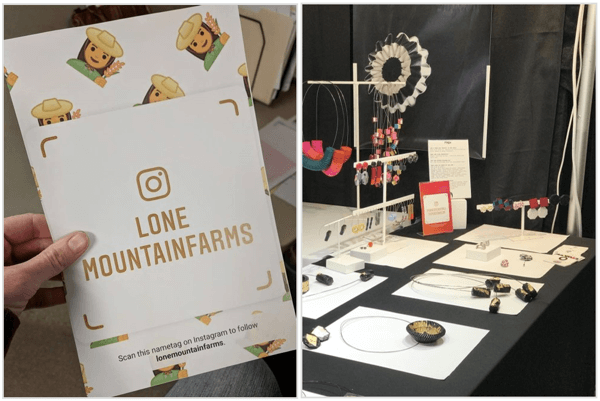 It’s also a great way to show off any user-generated content you might have on your Instagram on your website so customers are encouraged to shop and follow. Take a look at Studio Proper’s website, not only did they add their Instagram feed to their Shopify store. They also ensured to add the Instagram icon to their website footer just in case customer want to find their way to the account. Around October 2018 Instagram launched a new feature Instagram Nametags. Essentially this allows you to create and customize a name tag that can be scanned by other people so they could find your account easily on Instagram. Likewise, you can scan other people’s Instagram Nametags if you need to find them. Your Instagram Nametags offers a really a quick way for people to find and connect with you without having to type in your name in the explore page. With a bit of creativity, you can use them to get more followers and help people to find your account in a breeze. If you have other social media accounts like Facebook or Twitter, direct your fans from these channels to your Instagram profile. Just letting people know goes a long way rather than waiting for them to find it on their own. There you have it folks, 21 ways to get more Instagram followers. Having a massive following is a badge of honor for a lot of brands, but it’s useless you engage and build trust with them to create a community around your business. Ultimately you don’t just want followers, you want real people who are engaged with your content. What are your best tips for getting more Instagram followers, feel free to share it below and let me know!